The Indian stock markets have witnessed heightened volatility over the past three months. The Nifty 50 Index had shot up by 1,000 points in July and August, to reach a new all-time high of 11,700 levels. The joy was short-lived, however, as the Nifty came crashing down by 1,500 points over the next 40 days to the 10,300 levels. The markets are back to the October 2017 levels and this year's gains have been totally erased. The speed of this fall has led to some anxiety among investors. Volatility in the markets, as measured by the India VIX Index, has shot up by 12 to 21 in a matter of 40 days. Higher the VIX, higher the expected volatility in the markets. If you look at the five-year performance of the Nifty 50 index, however, it has delivered a compounded annual growth rate (CAGR) of 11 per cent (as on October 12). 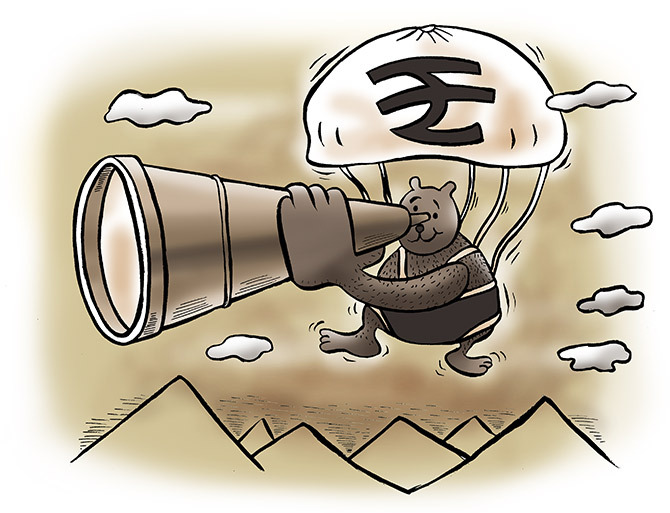 A longer investment horizon thus translates into lower volatility with high returns. So banish all thoughts of pausing your systematic investment plans or redeeming your investments. Equity investing is one area where being lazy can be beneficial. While volatility is an integral part of the equity markets, it is also present in other asset classes like commodities, gold, and real estate. However, high volatility does not mean low returns. Over the long term, equities have given returns way above inflation, beating all other traditional asset classes. India is a growth economy. More than 60 per cent of its population falls in the age group below 35. As a result, a large number of people are going to start earning, saving and accumulating wealth. While there will be ups and downs, the long-term direction will be upward. That is the reason why volatility is your friend -- each correction represents an opportunity to buy more in the equity markets. Equities are volatile in the short term and yet give excellent returns over the long term. To illustrate the point, let us look at how large-cap, mid-cap and small-cap indices have performed over the past five calendar years (please see table: Index returns over the long-term). The returns of these indices were extraordinary in 2014 and 2017 while they were rather muted in 2015 and 2016. In the current year, both the mid and small-cap indices have taken a big hit. However, if you look at the CAGR over the 57-month period, mid- and small-cap indices have given attractive 15% to 17% annualised returns. Those are just returns from indices. Mutual funds in each of these three categories have delivered higher returns than the indices (please see table: Funds vs indices). 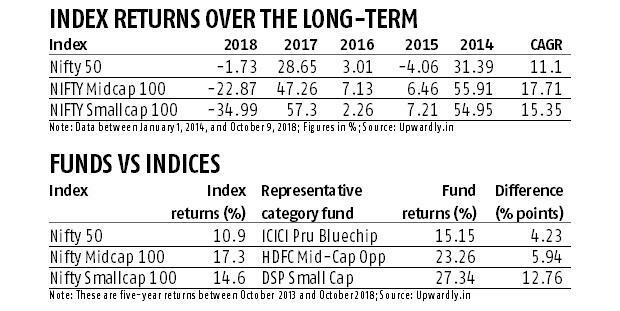 The data looks at five-year returns (October 2013 to October 2018). The funds in all the three categories have outperformed the indices by 4-12 percentage points. The results are the same if we take a 10-year horizon. Say, an investor made a Rs 1 million lump sum investment on January 1, 2008, at the peak of the markets, in HDFC Mid-Cap Opportunities. S/he would not have made money for the first two years and hardly anything until the end of 2011. But if s/he had remained invested till now, his initial funds would be worth Rs 5.2 million at a CAGR of 16.5%. Let us also see the performance of another person who started an SIP of Rs 10,000 on January 1, 2008, in HDFC Mid-Cap Opportunities Fund. This investor's total investment of Rs 1.3 million over a period of 10.8 years would now be worth Rs 3.7 million at a CAGR of 18.4 per cent. SIP can completely remove the risk of timing the equity markets. Spreading your investments across asset classes is the key to reducing the volatility associated with individual assets. Invest some portion of your portfolio in fixed-income instruments like debt mutual funds and corporate fixed deposits (FDs). Debt mutual funds: They provide good diversification to your portfolio. While debt mutual funds carry some credit risk and interest-rate risk, these can be minimised by investing in ultra-short, low duration or money market funds. A key advantage of debt funds is the indexation benefit one gets on holding these investments for more than three years. This can reduce the effective tax rate on the gains from debt fund investments from 30% (the marginal tax rate levied from individuals in the highest tax bracket on their interest income from fixed deposits) to as low as 5%, considering historical inflation rates and returns. This makes debt funds more attractive than bank FDs. While the recent defaults on bond payments by IL&FS have left investors worried, such defaults happen once in a blue moon. Again, investing in short-duration debt funds with high-rated securities minimises the risk of such defaults. Corporate FDs: They are another excellent product category for diversifying portfolio and minimising risk. They offer higher interest rates than bank FDs. Investments in corporate FDs of large and reputed companies can make your portfolio more stable. It is difficult to time the markets. For those investing a portion of their salary or business income, SIP is the way to go. For those with a large sum of money to invest at one go, a systematic transfer plan (STP) is recommended. In this plan, the investor puts the lump sum amount in a debt fund initially. Then, every month, a fixed amount is withdrawn from the debt fund and invested in an equity scheme. Both SIP and STP help in doing away with the risk of market timing. Since markets are down from their highs, investors will now get more units at a lower price from their monthly SIPs. Investing through SIPs in a volatile market helps reduce the average cost of investment. Investing systematically in mutual funds also helps inculcate a sense of financial discipline. SIP and STP and a long-term horizon is a great combination for wealth creation. Studies have shown that the longer your SIP investment period, the smaller the probability of getting negative returns. The chances reduce to less than one per cent if you continue investing for over six years. Investing doesn't end with scheduling an SIP or an STP. It also includes periodic monitoring and evaluation of your funds. Evaluate your mutual fund portfolio once a year. Looking at your investment portfolio value every day can be harmful to your wealth creation journey. Sometimes, it becomes crucial to replace an underperforming fund. If a scheme continues to underperform for more than 18 months or so, then it is time to replace it with a better one. Consult a professional financial advisor to help you review your investment portfolio. The advisor can also help in aligning your portfolio to your financial and lifestyle goals. Avoid depending solely on friends, family and gut feel for making investment decisions.